Is there another label that stands out on a beer shelf as much as the schoolbus yellow-highlighted Saison Dupont? I don't think so. This one's a little different from the standard, though- it's an annual special release, each of which is dry-hopped with a new varietal. This year it's Triskel hops, one I've never heard of before. Looks like a Dupont-made saison, so that's a good start. Smells like one too- that glorious Dupont yeast scent first and foremost. 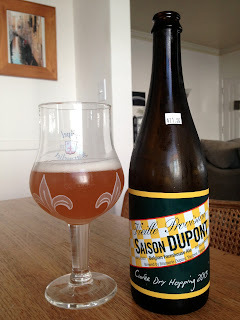 The dry-hopping is noticeable, adding a certain crispness that's more distinct than that of the other Duponts I've had. There's some light fruit, like pears maybe, and then...wait, I know what it is- it almost smells minty. Pretty cool, and definitely unique. There's one feature about the flavor of this beer that's distinctly unique as well. You take a swig, swallow it, taste it for a second, and then it's gone. It's super dry and spotlessly clean. The yeast flavors are there, but the hops just slice them right off, leaving no aftertaste whatsoever. Maybe I'm weird (well, no, not maybe), but this came immediately to mind while I was drinking it. This is a pretty remarkable beer, in that I don't think I've had another one that finishes so cleanly. And, oh, hey, it's just as delicious as everything else from Dupont.